The crash closed U.S. 301 for about an hour and 45 minutes, the Florida Highway Patrol said. 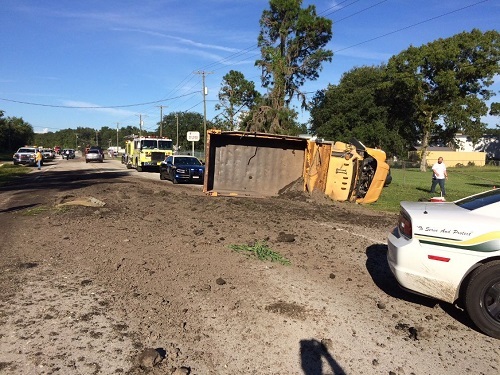 HILLSBOROUGH COUNTY – A dump truck driver was cited after his truck overturned this morning and spilled dirt across U.S. 301, the Florida Highway Patrol said. Carl F. Comadore, 56, of Avon Park, was cited for careless driving. He suffered minor injuries but was not taken to a hospital. The other driver, Jeanne P. Demarco, 50, of Zephyrhills, also suffered minor injuries. She was not taken to a hospital. 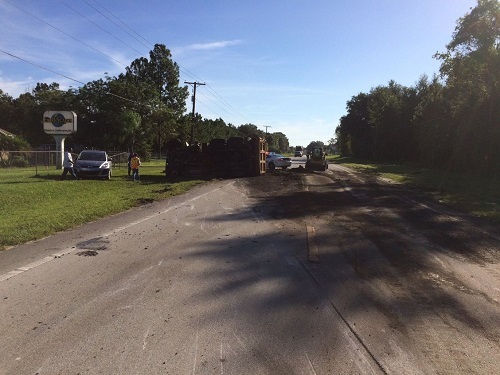 The crash happened about 8:33 a.m. on U.S. 301 approaching Stacy Road in Hillsborough County. Troopers said Comadore was driving a 2006 dump truck north on U.S. 301 approaching Stacy Road when he failed to see a vehicle that was stopped to turn into a private driveway. Comadore tried to avoid a crash by driving onto the east shoulder of U.S. 301. He over-corrected as he got back on the roadway and the dump truck overturned and spilled a load of dirt in the roadway and in the path of a 2010 Mazda CX7 driven by Demarco. Demarco swerved to the left shoulder to avoid a collision with the dump truck and hit a fence that was parallel to the roadway. U.S. 301 was closed until about 10:17 a.m.